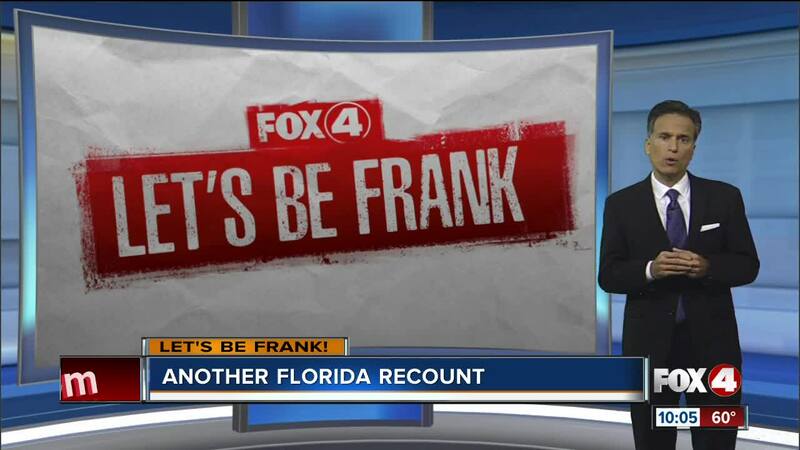 In this week's edition of 'Let's Be Frank', Frank Cipolla discusses how Florida has once again ended up in the election recount bullseye. The other day I was musing about.....wait a minute, hold on, folks. We have this just coming in...the results of the recount in Palm Beach County are finally complete, and yes, yes...Al Gore is president. I start with some levity today because if we don't laugh about what's going on, we'll end up crying. Here we are, 18 years, and 9 elections later, and we still can't get it right. Reporters from around the country are here anxiously waiting to hear who won the races for Florida Senate, Governor, and Agriculture Commissioner, and all we have for them is a shrug. Look, Florida is known for all sorts of things, including, unfortunately, some of the weirdest stories you'll ever see. Remember, the naked man walking his goat? Yeah, that happened here. I read an article the other day that an 11-year old girl at a cybersecurity convention out west was able to hack into the Florida election website and change the results in ten minutes. Now if she can do it, imagine what the Russians, or the Ukrainians or Mongolians or anyone with internet service can do. Some of you are old enough to remember when we actually had voting booths. Google it. You'd go in, push down a lever and at the end of the night, some burly guy with 15 keys on a key chain would open the back, count the votes, and phone them in. It wasn't fast, but it was accurate. And more importantly, you can't mistakenly misplace a box of levers. How is it with all the technology we have available to us, all the great minds out there, that almost two decades later we are right back where we started. The sooner we get this fixed, the sooner we can go back to the important stories. You know, like the naked man walking his goat. I'd like to know what you think. Email me at frank.cipolla@fox4now.com .